As a Gym Owner/Personal Trainer and long-distance runner I often get asked, “How do you find the motivation to workout or to run”? This is a really, great question. For me, it is the way I feel when I am in great shape. Physically, and mentally, I feel stronger. I have more energy. I sleep better. And I’m sure my family and friends will agree that I am probably more fun to be around. Of course, what motivates me, may not motivate some one else so I love to return the question and find out what motivated them. Although in answering there’s a common thread to ‘look good’ and ‘feel good’ there are many other reasons and hopefully one of them may motivate you to take that first step toward working on your fitness. Health/medical has got to be one of the biggest motivators people join a gym and one of the greatest rewards as a Gym Owner/Personal Trainer is when a client reveals that through exercise they have eliminated one or more medications. In the past month I have had a conversation with two Towne Fitness Members who are no longer on medication for High Blood Pressure, as a result of increased daily exercise. And, in both cases, I was thrilled to find out that their Doctor suggested they start an exercise program. Exercise should be at the top of every Doctor’s prescription pad. Look upon exercise as healing for the body and soul and not as punishment. It is a sad fact that a large percentage of the population are dependent on medication and that this could be eliminated by getting up and moving. If you want to know your health ‘risk factors’, take a look at your family history. What illness’s run in your family. That should be motivation enough to do something about it, before it’s too late. Joining the gym with a friend is a great motivator! What a wonderful feeling, knowing that you helped a friend get a workout in that they probably wouldn’t have done if it wasn’t for a little push from you. And trust me, you will also benefit on the days you don’t feel like exercising and they return the favour of a gentle ‘nudge’. Don’t have a workout buddy on the same schedule as you? Join a class. The best part about participating in this form of exercise is you don’t have to think. Arrive a few minutes early to warm up and then jump right in and follow the instructor. A full body workout in 35 – 45 minutes, 3 times a week will definitely work in your favour. Motivation to lose weight finds many people in the gym. If this is you, look around you for inspiration. Sometimes you may feel you are the only one in your situation and it all looks so easy for everyone else however that’s usually not the case. Everyone has a story and there are some truly inspirational ones at Towne Fitness. Also, too often we get frustrated by focusing on a specific number on the scale, which is a pretty quick way to zap your motivation, so concentrate on your mood after you’ve eaten a healthy meal or how you feel after a great workout—weight loss motivation doesn’t always have to come before an activity. If you focus on how you feel each time you exercise, you’ll get all the benefits of burning calories, plus the reinforcement of remembering how good it felt to do it, which should increase your motivation to do more. 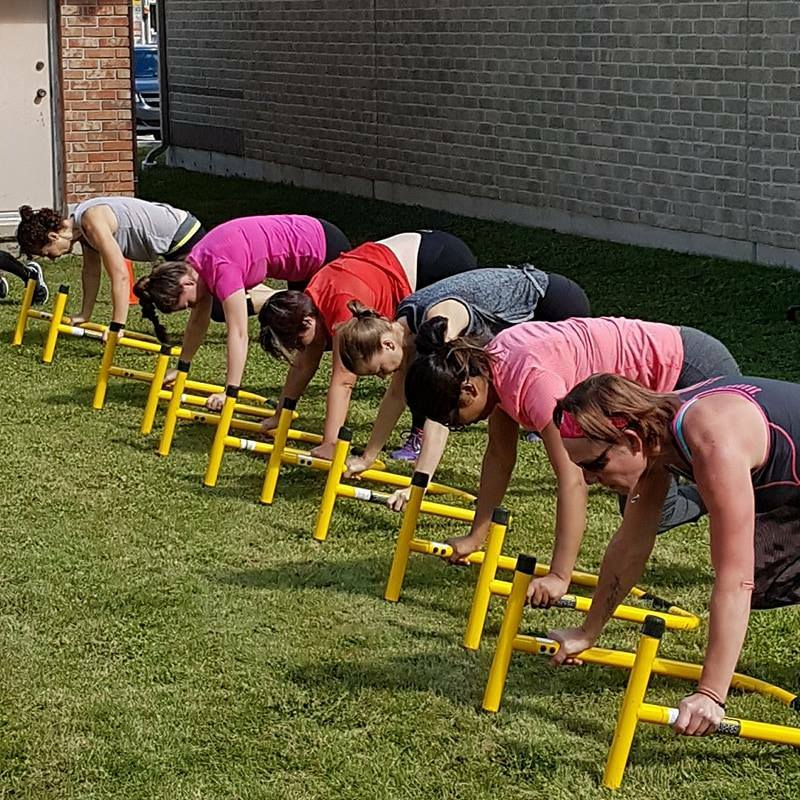 Towne Fitness has served the Towne of Shelburne for almost six years and during that time has built a strong ‘community’ within the gym. We have been fortunate to witness the growth of many friendships but none more than that of our members who participate in our Group Classes and our fast growing Running Group! Both, accommodate all levels of fitness and have demonstrated a strong sense of camaraderie and team spirit. I often tell members/clients to surround yourself with like minded people with similar goals. It helps to hang out with people who want to be healthy, too! Achieving a goal is a huge motivator, too and I have seen our TF Runners go from Beginner Running Group to complete; 5km, 10 km, half marathons, marathons and trail races. I don’t know what I get more excited about; my races or those of our Towne Fitness Runners. Their enthusiasm is contagious. I dare you not to be affected by it. We are well into the Fall Race Season and their training is paying off. This weekend, we have members travelling to upstate New York for the Wineglass Marathon and Half Marathon. Last weekend we had trail runners out at the beautiful Mono Cliffs Provincial Park for the 12km and 25 km trail race. Thanksgiving weekend I will be running the Chicago Marathon and the following weekend we have members running the Half Marathon in Niagara Falls. We will also be participating in the Run Bike and Hike this Fall in The County Dufferin Forest. Figure out what works best for you; working in a group, one-on-one with a Personal Trainer or going it alone. Either way, your personal fitness should be a priority and your loved ones will be grateful for your effort. Be the example for your partner and/or kids. Change your perspective. Instead of thinking about all the excuses why you shouldn’t workout today, think about how you will feel when your workout is completed. And buy the outfit. Why not look the part, too! Hannah Sine TOWNE FITNESS INC.
Love Yourself in the Month of February!